Even if, like me, you were a teenager in the 80s, you’ve probably heard of Laika. It’s a great story: the stray dog from the streets of Moscow, who became one of the first animals in space and the first dog to orbit the earth. The dog who died painlessly after her oxygen ran out; the hero who paved the way for human space missions. Only, that’s just the sanitised story. Sputnik 2, the Soviet spacecraft carrying Laika in November 1957, was hastily designed with no time for testing or quality checks. There was no mechanism to bring Laika back to earth and she died about five hours into the journey from heat exhaustion – facts that were covered up for almost half a century. Laika, the dog, is part myth, part symbol. The play begins with a frame narrative. Five wedding guests shelter during a storm in an old recording studio. After finding a set of radio play scripts, they assign parts and read to pass the time (without any accents, one of them commands, thankfully). At four microphones spaced across the front of the stage, they take on the roles of Yuri Gagarin (St John Cowcher), the first man to go into space; Sergei Korolev (Arielle Gray), the Soviet space program’s ruthless chief engineer; Vasily Mishin (Daniel Buckle), Korolev’s right-hand man; and, most importantly, flight technician Natalya Volkov (Taryn Ryan). Seamlessly, the scripts disappear and thanks to the magic of theatre, we are immersed in the drama of the space race, without the trappings of costumes or set. But this production is far more than four actors at microphones. From the evocative music, to the projection of archival footage, stars and moon, the audio and visual elements are stunning. The play’s novelty and brilliance is also enhanced by the “Live Foley”, performed by Andrew David. Foley (named after sound effects pioneer Jack Donovan Foley) began as an artform in the 1920s. Because radio drama pre-dated effective recording equipment, a sound effects person created all those footsteps and squeaky doors for radio plays live. 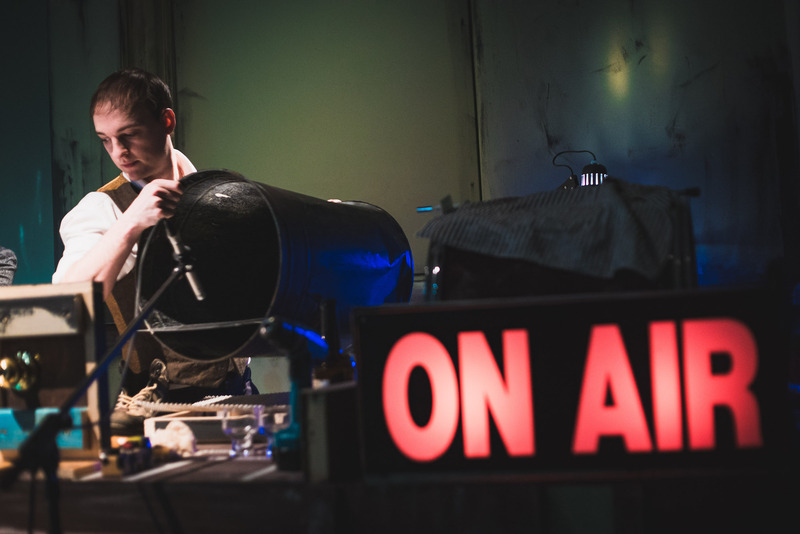 As well as offering an amusing and mesmerising sensory experience (a cross between watching a live orchestra and a celebrity DJ at the decks) Live Foley works on a symbolic level in this play. We can see the traditionally unseen. The “steam train” a radio audience would have sworn was real, is exposed as a bicycle pump; the “rocket launch” as an aluminium wobble board. And, for me, while this play is about the space race, it is really about truth-telling and propaganda and power and ethics. In one of the opening scenes, Laika is in distress, barking as the heat becomes intense. Yet the decision is made to cut the sound, so that the time of her death could be concealed. Natalya’s abhorrence of this callous act, the first of many, endears her to the audience. As the years go on, Russia’s competition with the US for space exploration and ideological dominance intensifies. Korolov pushes harder, taking more risks. Some of the missions are doomed and it cost lives. Our hearts are in our mouths every time that wobble board strikes up and another rocket launches. Like punk, it packs a punch, but given its skilful design and nuanced performances, it is positively symphonic. 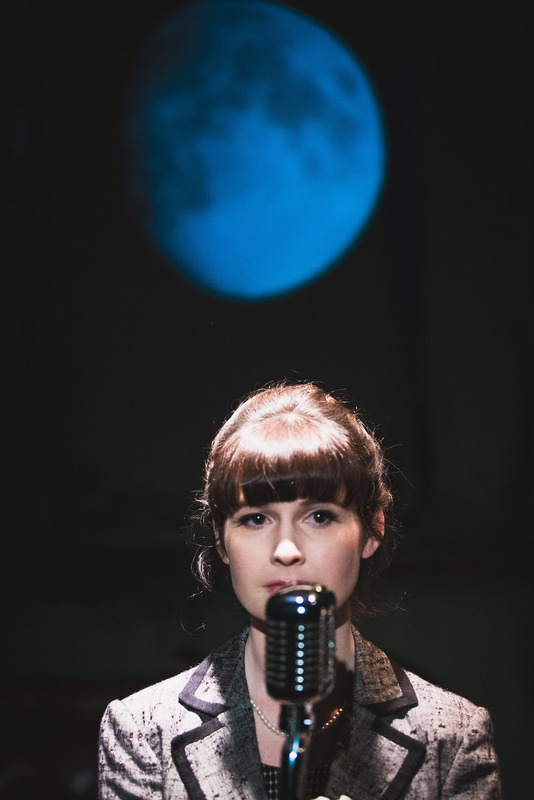 Laika: A Staged Radio Play is on at the Blue Room Theatre until September 30.